More than three hours behind schedule, staff at the Broward Supervisor of Elections Office began sorting all of the Page Ones from ballots. The true recount is expected to start Monday afternoon. Three close statewide races are being recounted, as well as four local races. Broward's Supervisor of Elections has been accused of fraud. And prolonged ballot counting has many people reminiscing about the infamous 2000 presidential election between George Bush and Al Gore - when it all came down to South Florida votes. Rumors of a recount started to buzz louder last Thursday. Votes were still being counted at the Broward County Supervisor of Elections' Office - around the back of the Lauderhill Mall-, when concerned voters started to line up to verify in person, that their absentee, vote-by-mail, and provisional ballots were, in fact, included in the count. Eva D'achiardi stood in line because she was worried that her vote by mail for Democrat Andrew Gillum wasn't counted. "When I checked online to make sure it was valid, I didn't get any validation that my vote had been counted," she said. She was finally told that her vote did get counted. But she still left frustrated with the process. "Why can't you get an automatic response or validation that your vote was counted in, that it was time-stamped, your location? I feel like...it's not organized enough," she said. From that point on, the Lauderhill office became a media frenzy. Reporters from local and national outlets swarmed Supervisor of Elections, Brenda Snipes. A reporter asked why the ballot-counting was taking longer than other counties. "We are counting five pages, or six pages, for each of the people who voted," Snipes said. "Let me go check. I'll check." Snipes insisted that there was no problem with counting ballots on time in Broward. "I've been doing this now since October 22nd. We ran 22 sites, we ran 14 days, we ran 12 hours, we had a big vote by mail. So don't try to turn it around to make it seem like I'm making comedy out of this," Snipes told reporters. Canvassing Board members, Judge Betsy Benson,l eft, and Judge Deborah Carpenter-Toye look over signatures on ballots at the Broward County Supervisor of Elections office in Lauderhill, Thursday, November 8, 2018. As the difference in votes between him and his adversary narrowed Thursday night, Governor Rick Scott announced he was taking his fight to wrestle the U.S. Senate away from Democrat Bill Nelson to court. He's suing Palm Beach County elections' chief Susan Bucher as well as Snipes. Both women are registered Democrats. "Every Floridian should be concerned there may be rampant fraud happening in Palm Beach and Broward Counties," Scott said. "And the Broward Supervisor of Elections Brenda Snipes has a history of acting in absolute bad faith." 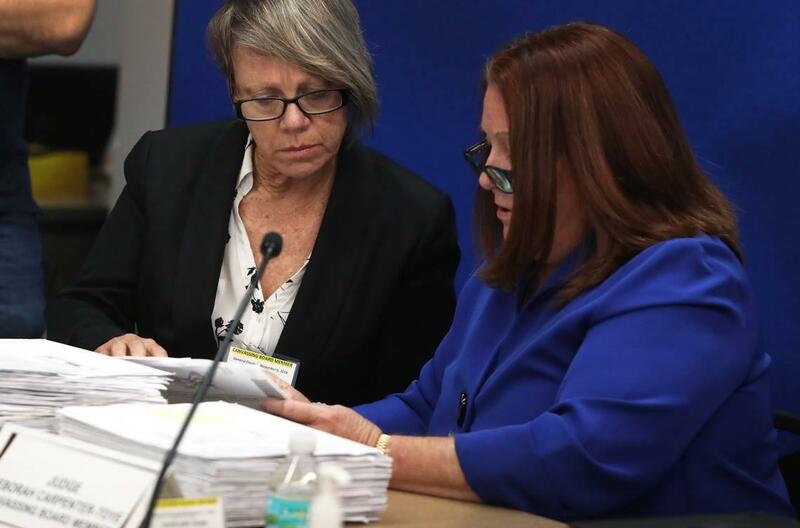 Back in the August Primary, thousands of vote-by-mail ballots were discovered uncounted in Broward the day after the election. That lead to two recounts in local races. And there were issues with a 2016 congressional race. In May this year a judge ruled Snipes violated state, and federal, laws by destroying ballots too soon in the Tim Canova, Debbie Wasserman Schultz race in the Democratic primary. By Friday morning, the protestors had arrived. They echoed comments made by President Donald Trump on social media, as well as Governor Scott: That Democrats may be trying to steal the election from Republicans. "Stop the steal!" they chanted. Rebecca Kanakis came from Plantation to join in the first protest, organized by Republican groups. "I'm tired of being the embarrassment of the United States," Kanakis said. "We shouldn't be having these issues," she said. Inside the Supervisor's office, the people in charge of looking at questionable ballots were doing their jobs. They're called the canvassing board - and they can move questionable ballots forward or reject them. This year, it's made up of Snipes and two judges, Betsy Benson and Deborah Carpenter-Toye. Some of the reasons ballots were disqualified were because people filled in ballot bubbles with things like X's and check marks - lines and circles, instead of filling them in. And if you voted at the wrong precinct, or your signature didn't match the one on your driver's license exactly...those weren't counted either. But many - like people who changed their address - got through. Giving individual ballots the third-degree is where some of the headaches of the 2000 presidential election come back to South Floridians. "There's the legal questions about what is and isn't a valid vote. But then there's the [public relations] fight for the politics of perception," said history and political science professor for Nova Southeastern University, Charles Zelden. He said this recount feels familiar. "And we've fallen right back into the same pattern we saw in Bush V. Gore in 2000," Zelden said. "Is this votes being stolen? Is this counting every vote?" he said. Broward did file its unofficial results to the state; 11 minutes before the Saturday deadline. But not all of the results - only 99.997 out of 100 percent. 25 more pages of ballots needed more time - the canvassing board submitted them after the count was due. Governor Scott's lawyers filed a separate lawsuit to get those 25 pages thrown out of the total count. Florida's Secretary of State ordered machine recounts for the Governor, Senate, and Agriculture Commissioner races - and those were supposed to start early Sunday morning. The Broward County canvassing board is also supposed to conduct a machine count in the local races for Plantation Mayor, Pompano Beach Mayor, West Park City Commissioner Seat 1 and Walnut Creek Community Development District 3. But again - Broward wasn't ready. One of the ten machines had a glitch that delayed the recount process for more than three hours. Phase one of the recount finally got underway just before noon Sunday. But first, every single ballot in broward county has to be run through machines. And that machine has to spit back out only page one - where the races to be recounted are. The county has about 3.5 million pages of ballots - sorting is expected to be done sometime Monday afternoon. That's when the machine recount really begins. "This could go on for a while," Zelden said. Outside the office Sunday afternoon, protestors had stuck around. Republican groups had put up blue tents to wait out the drama - with flags and big speakers. People were dancing in the parking lot to country music...and to 'Revolution' by the Beatles. Broward, and the rest of the state, has until Thursday afternoon to finish the machine recounting - before any hand counts can begin. A backlash to the tightening governor and senate races grew on Friday as dozens of angry Republican voters rallied outside the Broward County Supervisor of Elections office where provisional ballots were still under review.